In celebration of Genlux Magazine’s fall issue featuring cover model Carmen Electra, the multi-talented performer is scheduled to host in conjunction with Dr. Katherine Lee, an exclusive charity event and fashion show to benefit En Plein Air, Dr. Lee’s charity. The event is featuring two fashion shows with luxe designers David Meister and SK Kimono. The evening will also feature an exclusive performance by jazz singer Courtney Fortune, providing guests an evening of fashion, music, philanthropy, a silent auction, cocktails and dancing. The event shall be held on the rooftop of Halcyon Dermatology in Laguna Hills, California. Genlux Magazine, the fashion meets philanthropy publication, along with Halcyon Dermatology, is hosting this first annual event with all the proceeds going directly to raise awareness and education of En Plein Air. En Plein Air is an Orange County based charity that offers scar removal for cancer patients, burn victims, and other patients in need — providing the service free of charge with the help of painless, effective, laser treatments. 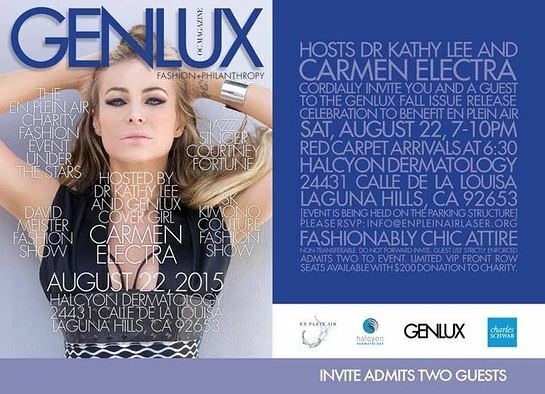 Superstar Carmen Electra is appearing in support of the event courtesy of Genlux Magazine. Cocktails and hors d’oeuvres will be served to guests before the fashion catwalk with models strutting down the catwalk showcasing David Meister’s newest collection, and SK Kimono closing the evening with a sneak peak into their lavish one of a kind designs. Attendees have the opportunity to learn about and view live demonstrations of the latest aesthetic treatments offered by Halcyon Dermatology. Exclusive discounted treatments will be offered by Halcyon Dermatology, with portions of the purchased treatment costs going to benefit En Plein Air and its mission. The charity event/fashion show will be held August 22nd, 2015 at 7pm in Laguna Hills. To request tickets or learn more, click here.